It’s easy to assume that you can’t start building a new fence in the fall. It’s easy to assume that you can’t start building a new fence in the fall. However, in this case, an assumption is an unreliable way to approach any new skill. If you decide to build a fence this weekend after all the excitement of Halloween subsides, then just follow these tips. Tools: Tape measure, post hole digger, leveling tools, gloves, and protective eyewear. Supplies: Fence panels and posts, fence post caps, gravel, concrete mix, nails, screws, stakes, and twine. The next step is to talk to your neighbor. This is especially important if you share a property line with your neighbor, and you’re not entirely sure where the line between their yard and theirs is. Plus, it’s just good manners. 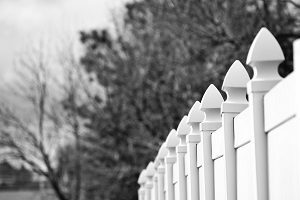 You may need your neighbor’s written consent before you can do anything, even if they don’t offer to help you build your new fence or contribute to the cost of its construction. Once you’ve run the idea of a new fence by your neighbor, you might have to get a permit to start the process of actually putting it together. For one thing, your HOA might require you to do this as per county and city regulations. Part of getting that permit means following guidelines about how tall the fence can be, and if it will spoil the view for anyone, even visitors who are passing through on the way to their next destination. Once your request to build a new fence has been approved, the next phase of construction begins. This is the part where you determine the location of the fence if you haven’t already seen to it. Use some stakes and twine to indicate where the fence will go, and then get in touch with your utility providers to make sure you won’t damage any underground lines before you start building your fence. This entry was posted on Friday, November 2nd, 2018 at 2:31 pm. Both comments and pings are currently closed.